The allure of using algae to power the world’s vehicles has been at the heart of many business plans over the years — some that have failed spectacularly, and some that are still chugging along down the long road to commercialization. But 2013 could represent a pivotal year for some of the algae fuel leaders that have spent years raising funding, building pilot projects, and selling their algae into niche markets like as an ingredient in high-end face lotions. One of the companies that’s the farthest along is Solazyme (s SZYM), a South San Francisco-based company that went public in the spring of 2011. Solazyme was one of the first firms to focus on the alternative chemicals and personal care markets, developing a small but steady revenue stream as it braced itself for the difficulty of churning out its algae oil at a scale and cost that can compete with oil for transportation. 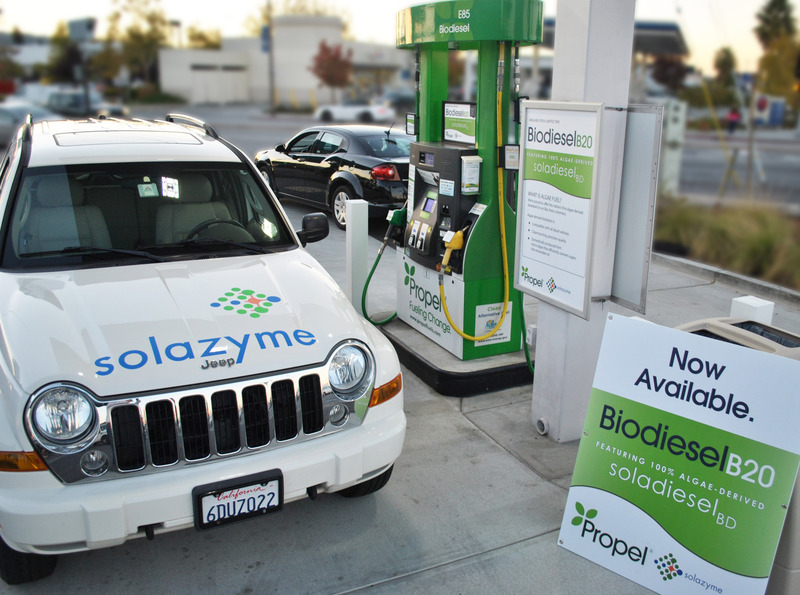 But Solazyme is now at the brink of ramping up its algae oil for fuel, too. This week the company said that its Brazilian joint venture with food processing giant Bunge — called Solazyme Bunge Produtos Renováveis — has received approval for a $120 million loan from the Brazilian Development Bank to build out its first commercial-scale algae fuel factory in Brazil. The factory is already under construction (it started in the summer of 2012) next to Bunge’s sugarcane mill in São Paulo (it uses sugar for a feedstock). Solazyme hopes it will be ready to go by the fourth quarter of 2013. Initially it will produce 100,000 metric tons per year, but eventually by 2016 it’s supposed to make 300,000 metric tons annually. Solazyme also plans to reach commercial scale of its algae fuel in the U.S. soon, using a factory in Clinton, Iowa owned by agriculture giant ADM. That plant is supposed to make 20,000 metric tons of algae oil per year in early 2014, and eventually 100,000 metric tons per year. It also has its own smaller scale development factory in Peoria, Illinois. Sapphire Energy is another company that is looking to cross through the so-called Valley of Death from low volume production to commercial scale that can one day compete with oil. 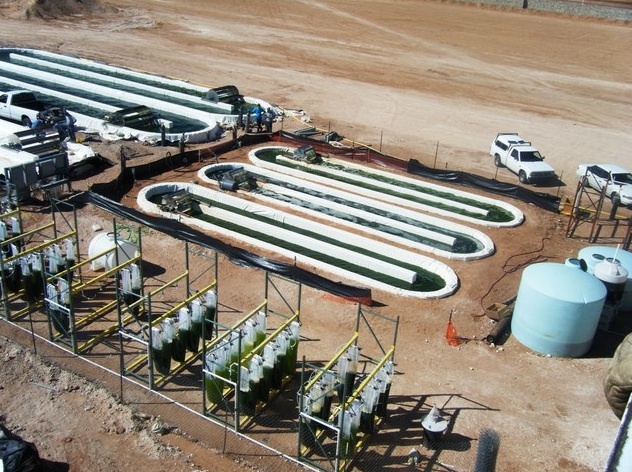 The company has a 2,200-acre algae growing farm in Columbus, New Mexico, which has 70 ponds, each the size of a football field, as well as a refinery on site. The New Mexico refinery reportedly started producing oil in low volumes last summer and by 2014 is supposed to be able to make 1.5 million gallons of algae crude per year, and 10,000 barrels a day by 2018. 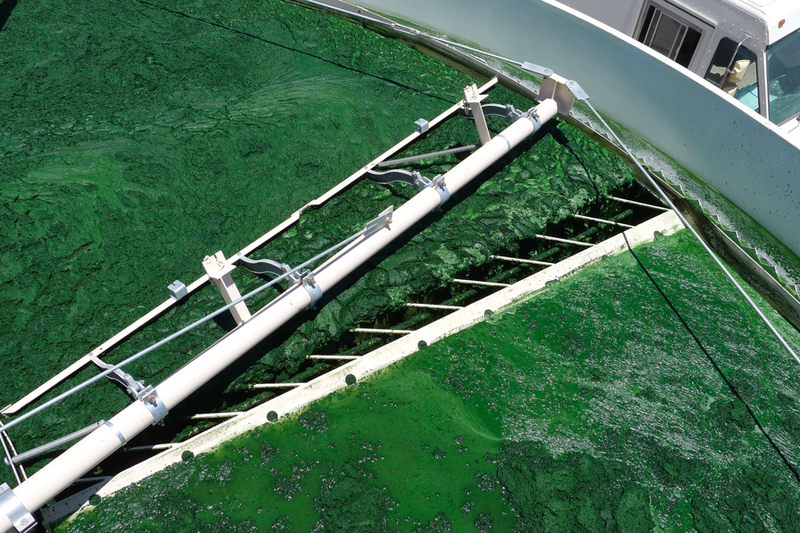 Sapphire and Solazyme are attacking the algae oil industry with different approaches. Solazyme grows its algae in closed fermentation tanks, while Sapphire is growing it in the open air on large plots of land. Open air ponds could theoretically be cheaper, but they face the problem of making sure they don’t get contaminated and disturbed by outside elements. Another company working on algae fuel is Synthetic Genomics, which is the brainchild of genomics guru Craig Venter. Venter beat the U.S. government at being the first to sequence the human genome, and also led his team in recent years to be the first to make the world’s first synthetic bacterial cell, called the first artificial life form by many. The researchers built a synthetic chromosome and inserted it into a living bacterial cell, where it took over the cell and became an entirely new life form. Synthetic Genomics was able to score a massive, potentially $600 million, development deal with Exxon. Last spring, Synthetic Genomics bought a 81 acre site in the Imperial Valley, near the Salton Sea, and it plans to scale up and test its algae strains there with 42 open ponds. Scaling up all these new factories and farms take a colossal amount of money. But they’re needed because the algae oil needs to be produced at a huge scale to get it cheap enough to compete with oil. The costs no doubt take a toll on these pioneers. Solazyme’s net losses are growing, and the company lost $58.52 million for the nine months ended September 2012, up from a $38.32 million net loss for the same time the year prior. The company will not likely be profitable for years, and it’s helping fund its production deal with ADM with equity. This week Solazyme said that it intends to sell $100 million worth of notes to help it build its projects. Sapphire Energy raised at least $300 million from venture capitalists and investors like Cascade Investment, which is owned by Bill Gates. Good thing Sapphire got that money in the bank, because few venture capitalists these days are willing to put in hundreds of millions of dollars into such infrastructure for clean power projects. Sapphire also got $50 million in stimulus funding and a $54.4 million federal loan guarantee. Synthetic Genomics has its potentially $600 million development deal with Exxon, though I’m not sure the status of that currently. Venter has said that biofuels made from algae that will be able to scale, and compete with oil, will have to be synthesized and will not come from nature. The Exxon deal was originally to research naturally occurring algae cells only (not synthetic ones), but Venter hopes Exxon will come around to funding the research based on synthetic algae cells. Who knows if algae fuel will ever get there — if Venter is right, it’ll have to be a completey new type of synthetic super microbe that delivers algae oil as efficiently as possible. But 2013 is a year in which these three algae fuel players look to scale, and will spend a lot of money to get there. Algae likes to grow in warm water, and even the desert of NM gets cold at night, slowing the growth of this plant. America is over the next number of years converting it’s power plants from coal to natural gas. With the technology of Condensing Flue Gas Heat Recovery the heat energy can be recovered from these power plants exhaust. This recovered energy could be used to heat these many hundreds of acres of algae ponds day and night, summer and winter. Algae also benefits from CO2. When the heat energy has been recovered from the exhaust, what is left is COOL CO2 that can then be injected into these algae ponds. There is evaporation from these warm ponds, and a lot of this evaporation can be replenished with the water recovered from this combusted natural gas. America could have a lot of natural gas power plants across the country operating at near Zero emissions and reducing global warming. The CO2 would be converted to oxygen as it enters the atmosphere. And how many full time jobs could be created from all this waste energy? whenever I see articles on this subject matter, the cost analysis always seems to miss the “biggie” – the cost to separate oil from water and biomass (imho). Growing algae in bulk is relatively easy. My perception was that the real innovation needed for this industry to take off, is cost effective separation of the oils from everything else.